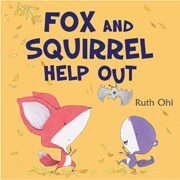 Ruth Ohi’s latest picture book, Fox and Squirrel Help Out, displays the same visual humour, comic timing, and gentle inclusiveness that make her work acclaimed and appreciated by children and critics alike across Canada and beyond. Ruth’s books—now 60 of them—have been nominated for the Amelia Francis Howard–Gibbons Award, the Mr. Christie Award, the Marilyn Baillie Picture Book Award, the Governor General’s Award, and the Blue Spruce Award. Her books have also been included in “Baker’s Dozen: the Best Books for Family Literacy,” Ontario Librarian Association Best Bets, and Canadian Children’s Book Centre Best Books. 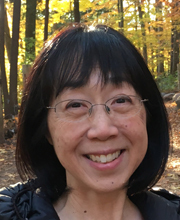 Ruth served as Writer-in-Residence at the Toronto District School Board and is passionate about working with young people through art and writing. Whether sharing her work at festivals, schools, or libraries, her quick pencil and marker sketches create special bonds with her young audiences. Ruth lives in Toronto with her husband and two daughters.